Magnetic letters and numbers help pupils make the previously abstract concepts more tangible, because it also engages the tactile sense. Each box contains approx. 100 foam symbols (only letters or numbers), which contain a magnetic sheet on the back that makes them adhere to metal surfaces, such as blackboards and whiteboards and even magnetic paint. 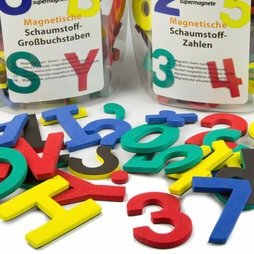 The magnetic letter set consists of approx. three parts uppercase letters; the rest are punctuation marks. There are red, blue, yellow and green symbols to form individual words and simple sentences. The magnetic number set consists of 76 numbers and approx. 25 operation signs. There are red, blue, yellow and green symbols for simple math exercises. The symbols adhere to metal surfaces. Besides blackboard and whiteboard you can also use them on walls painted with magnetic paint or at home on the refrigerator. The symbols won't adhere to magnetic glass boards though. Maybe your child will also be fond of leaving short messages on your fridge. The magnetic symbols are made of foam with a magnetic sheet on the back. They are suitable for children 4 years and up and can be used in preschool or elementary school. Children under 4 must not use those symbols without adult supervision due to the danger of swallowing. The magnetic sheet on the backside loses its adhesive force only through external influences. Keep it away from neodymium and ferrite magnets and temperatures above 85°C, and its adhesive force will remain intact.